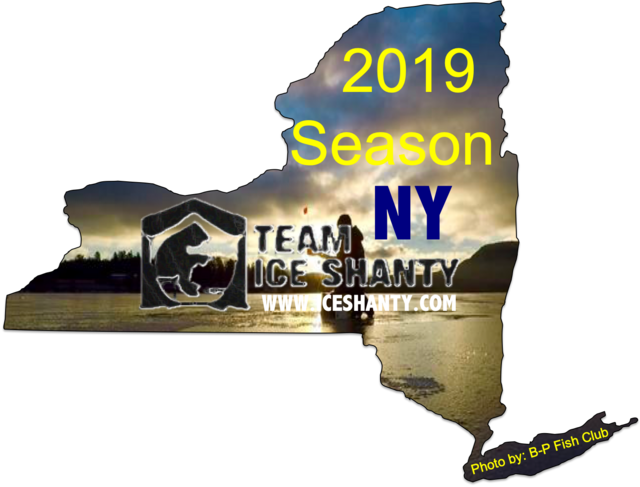 ICE FISHING CONTEST: Just saw a posting on FB for an ice fishing contest sponsored by Swan Lake Hose Co..... Jan. 27 on Swan Lake (assuming there's ice). Check in 6 AM. CSwear01 welcome to Ice Shanty. While this thread is titled Southern NY. the posts found in the thread mostly cover the South Eastern NY. area if you put your computer cursor on the word forum (under your login welcome) and click you will open the page listing all forums/boards here on Ice Shanty. Scroll down to the New York General l forum and click at top of post listed (right side of computer screen you should see words New Topic .Click on those words and it will open a page start your post remember to fill in subject line. Also scroll through the NY. General forum there maybe a thread similar to this one for the section of NY. you have an interest in best to you this ice fishing season. Ice Balls thank you for the info. on Swan Lake,NY. fire dept. contest I see someone already contacted Raquettedacker and he has posted the info. in the contest and derbies thread. You will also see post for King of the Ice contest. Keep checking the Sullivan County Conservation club's website and Facebook page for more info. only see contest date and location listed at this time. Shortly there should be a registration form and contest rules posted you can print out both I believe ,you will still need to stop at registration location day of the contest to pick up your ID button and confirm that you are registered. Still patiently waiting to here from Monticello FD will go through my ice fishing stuff and see if I have an old advertisement that may contain a phone number. Steve: The Mahogany Ridge contest usually takes place on the day before King of The Ice. Hello everyone does anybody knows if morningside lake in fishable?? Thank in advance!! IceBalls I'm more concerned if the entry fee or other things with the Mahogany Ridge contest have changed from last year. You are correct ice conditions permitting the contest is held on the Saturday before King of the ice contest. I believe its catch and release...has lots of dink perch ..but that was some time ago .There was a recent draw down(2 yrs ago or so) to fix the dam . Not familiar with its exact depth but like most lakes in the area sure its no more then 15-18 fow at its deepest near the dam area .Access is private. Well the temps are going to cooperate beginning by days end ..but the wind is pretty steady at 15 plus mph now and expect to continue all day/night ..some of the southern most parts of the larger bodies of water has ice forming(again) but getting a beaten due to the wind..smaller lakes and ponds may be fishable by Sunday..some by Saturday lil further North ..don't expect it to be much more then 4 inches by the end of the weekend on said ponds/lakes ..looks to be making ice for the next 15 days north of Wurtsboro NY area. I believe its catch and release...has lots of dink perch ..but that was some time ago. Access is private. Going back to 1970 I was working at the Dodge Inn steak house which is right across from the water pump house. I fished Louise Marie a lot back that summer and caught a bunch of monster pickerel and bass. My wife worked at Hershel realty and he has the big house right at the dam. Not sure about the lake association rules regarding ice fishing but your buddy should be able to find out from the association. I am very sure it has all the basic shallow water fare, bass, pickerel, perch, cat fish and possibly crappie. I never heard of any trout or walleye in it and doubt they are in there. Hardwater might know about two other lakes I have always wondered about. Wanasink allows fishing by association owners and guests but I have no idea what they catch. Back in the late 60s and early 70s I worked at the Concord and I know for sure they put trout in Kiamesha and allowed guests to fish for them. If the guest caught some fish they would even cook them for him. I have no idea what they catch there now but I do see guys fishing it all summer and sometimes on the ice. If the trout are still there they can't be kept in ice season because of the regulations but I would love to know what fish they do catch and how deep that lake is. I would give them a try ...all three lakes.. I haven't seen many ...if any on the lakes around Emerald Green ..so not much winter pressure...add electronics to that mix could get a good handle on it in short order . As for Wanasink lota pickerel..not certain any trout ..been told there is a 30 foot spot .. some scrappy small mouth.. nothing of great size but good eaten size/fight. Hello gamalot. I do fish Kiamesha about two three times a year. I morning go about 10-20' of water for I'm sure you can find deeper spots if. As for fish. Crappy, putch, Bass pick, and cat. I haven't caught anything else. I have seen 2 different dates for the Swan Lake contest . One date was 1/27/19 & the other date was2/27/19. Im not sure what date is correct ? harwater Diehard thank you for the updated information on the King of the Ice contest. Need Ice welcome to Ice Shanty. Wet Dreams I think the February date is a back up bad weather/unsafe ice in Jan. Keep a watch on the Swan Lake FD's facebook page I'm sure people will be asking questions closer we get to Jan.27 TH. The one that I read on facebook had no contact information. I don't know if theres any way to get in touch with someone from the Swan Lake Fire Department ! Thank you Mr clean. Going to check on some ponds Friday. Any requests? Yes. That's one I was going to do. I was out there before we got all this rain we had 5" at that time. Yeah I also got out once 2 weeks ago and had 4.5" before all the rain hit. I hear there's nice crappy on that side. Never finished it. How is the walk dragging a full sled? I fished superior on Tuesday on the side closer to 17b there was 5 inches of ice but the shoreline was shot we were able to get on but you might want to bring a plank with you just in case the edges dont stiffen up with all this wind as for fishing nothing great bunch of small perch and pickerelI would have NEVER guessed that. good for you to venture out! My post got mixed in with your quote. I would have never guessed you would find that much ice Tues.
Well I did a little drive around in my local area this morning ..the overnight winds has kept the waters open for the most part ..some ice forming in sheltered cove/bays and forming on the outer edges..it had been below freezing since just before sunset yesterday but windy ..24 F now..winds are expected to be 24 mph but diminishing through the next couple of days...next 10-15 days looks to be good for ice making. Thanks for the heads up. But not fun dragging a full sled throw mud. Maybe I'll try it one year when I pack light.